Outdoor Nature Summer Camp 2019! SOLD OUT! Thank you for your interest in our summer camps! Follow us on Facebook for updates, news and all our events and happenings. Hi! 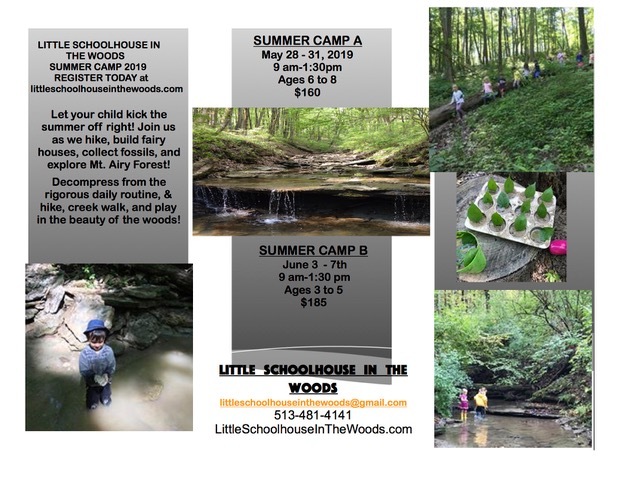 Thanks for your interest in Little Schoolhouse in the Woods 2019 Summer Camp! We are excited to share our Outdoor Nature Summer Camps in late May/early June! We have two camps for two age groups. Registration is at the bottom of the page. Please read through all the details so you sign your child up to the correct camp. Our summer camp is outdoors (with the exception of unsafe weather), so dress appropriately. After you have registered below, we will email you the necessary forms via the email you used. Just a couple of notes for you to consider. We will be doing lots of hiking and playing in the woods of Mt. Airy Forest, so keep that in mind when you are getting your child ready. Children will need sturdy boots or creek shoes that will be comfortable enough to hike and play in the woods and at the creek. Even though we will spend a lot of time in the shade of the woods, we advise sunscreen, and a reliable bug repellent is always recommended. Please, don’t bring personal items like toys and flip flop shoes or electronics. Children should bring their lunches. We will provide a healthy vegetarian mid-morning snack. If your child has a special diet, please be sure to provide an appropriate alternative snack for them. Thank you for considering our Outdoor Nature Summer Camp. Your child will love exploring nature with us! We are so excited to share some outdoor adventures with your child! Feel free to email or call with any questions or concerns. Thanks!